Classic Curves Jewelry - This is a gorgeous handcrafted sterling silver pendant that frames a large faceted round brown Smoky Topaz, Smoky Quartz (15mm). This elegant asymmetrical One-of-a-Kind necklace comes with an 18" sterling silver snake chain. 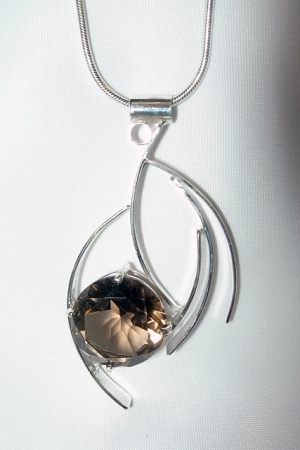 Handcrafted sterling silver pendant with round faceted smoky topaz. This exquisite pendant is suspended from a handmade sterling silver snake chain. This work of art is signed by Aaron.